In the past, the opening comments from the Patriot League Executive director took a good ten to fifteen minutes. But since it was Jennifer Heppel‘s second day on the job, her opening comments were short and sweet. “I turned on the computer, retrieved a voicemail, and despite the fact that I was convinced I would lose the battle, I considered it a day well lived,” she said. 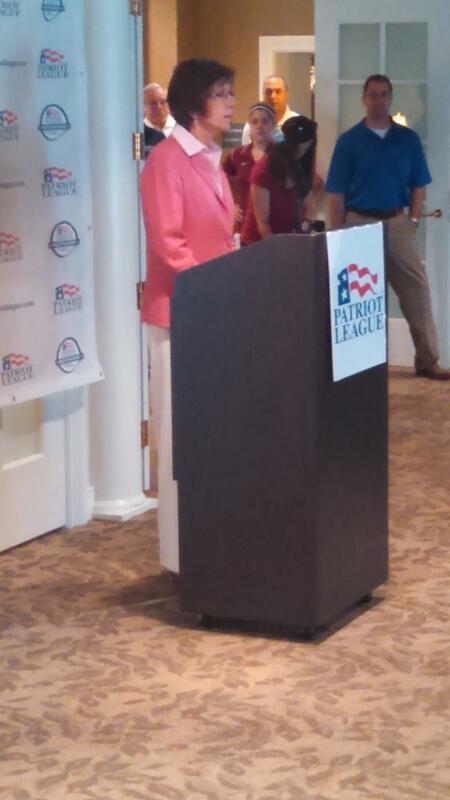 Before addressing the assembled media at the Green Pond Country Club, she had met with all seven Patriot League football coaches and discussed the different rules changes. 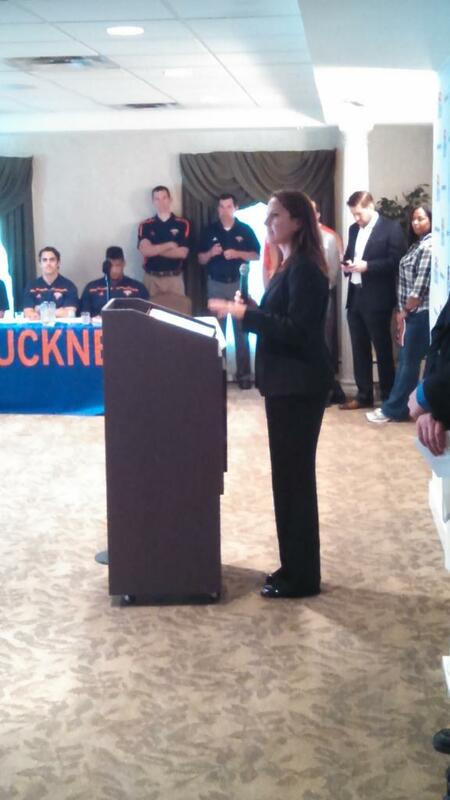 “I couldn’t be more excited to be here honored to be the next leader of the Patriot League,” she continued in her brief comments. A few minutes later, Lehigh was picked to finish fifth in the preseason Patriot League football poll. Sophomore WR Troy Pelletier, junior LB Colton Caslow and senior P Austin Devine were named to the preseason all-League team, and just like that, the media were unleashed to meet with the coaches, administrators, and athletes. It was not a shock, at the Green Pond country club halfway between Bethlehem and Easton, that Fordham was picked to finish first in their first season back as a full card-carrying member of the Patriot League. After all, they had two preseason Walter Payton award candidates on their roster, QB Michael Nebrich and WR Sam Ajala, as well as 10, count ’em, 10 other members on the Patriot League preseason All-League team. Scholarships, and the great coaching and recruiting ability of head coach Joe Moorhead, had Fordham as the runaway favorite. It was a shock, however, to see who was picked to finish right behind the Rams. Though Lehigh was coming off a 2013 season where they were ranked in the Top 25 most of the year, they only had two players on the preseason all-League team, senior OL Ned Daryoush and senior DL Tim Newton. Nonetheless, the Mountain Hawks were picked second over the two teams that beat Lehigh last season, Lafayette and Bucknell, the two teams that kept Lehigh from a Patriot League championship and the FCS playoffs last season. The vote was close – only three votes separated the Maroon and the Brown – and it showed how little separates the rest of the Patriot League in the eyes of the coaches and media.